In [this video](https://youtu.be/m2X-ZalBFCE?t=13m11s) that shows longtime U2 guitar tech Dallas Schoo inspecting Edge's Bob Bradshaw-designed rig prior to 1997's PopMart Tour, a Blue Box pedal is visible at the [15-minute 48-second mark](https://youtu.be/m2X-ZalBFCE?t=15m48s). According to WholeLottaLed, "It was used to create the annoying octave down fuzz for the Fool In The Rain solo." Jimmy Page's use of the MXR Blue Box backed up by http://www.jimmypage.co.uk/equipment.htm and http://www.jimdunlop.com/product/m103-blue-box-octave-fuzz (Dunlop is the current owner of MXR, the creators of the Blue Box). The MXR M103 Blue Box is used by Slash. 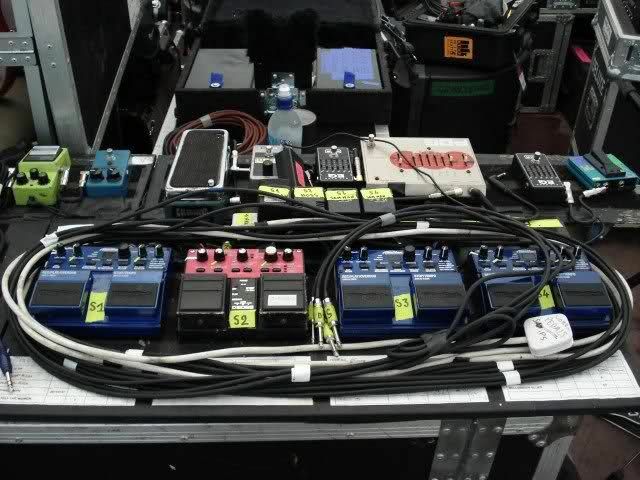 According to his "gear list", Robertson uses the MXR Blue Box. 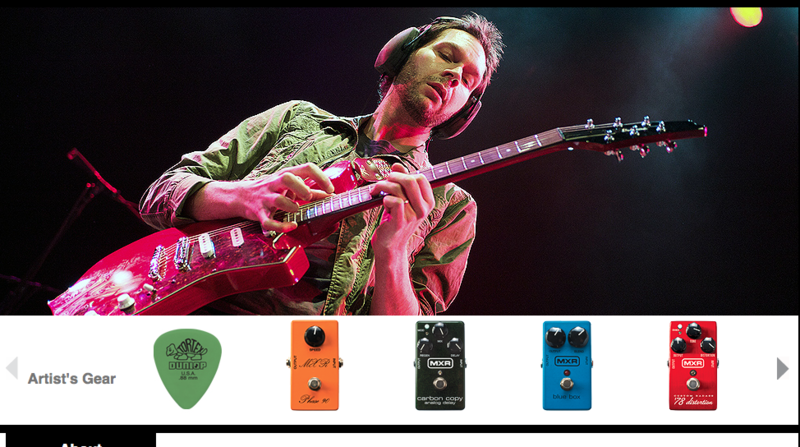 Paul GIlbert's gear includes an MXR M-103, according to Dunlop's [website](http://www.jimdunlop.com/artist/paul-gilbert). 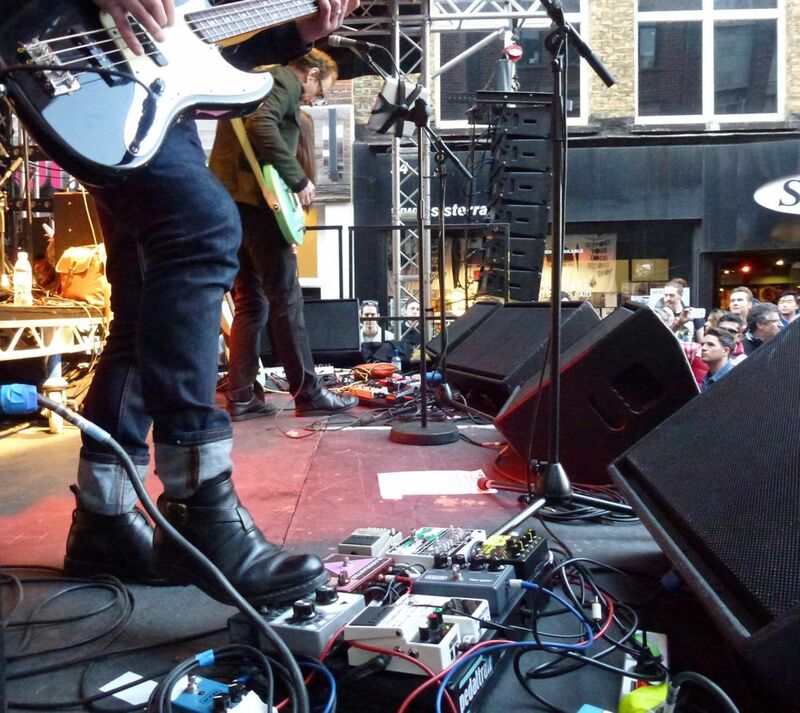 Thurston Moore uses a MXR Blue Box in Sonic Youth as seen in this picture of his board. It is also listed on the [Sonic Youth website](http://www.sonicyouth.com/mustang/eq/thurston.html). 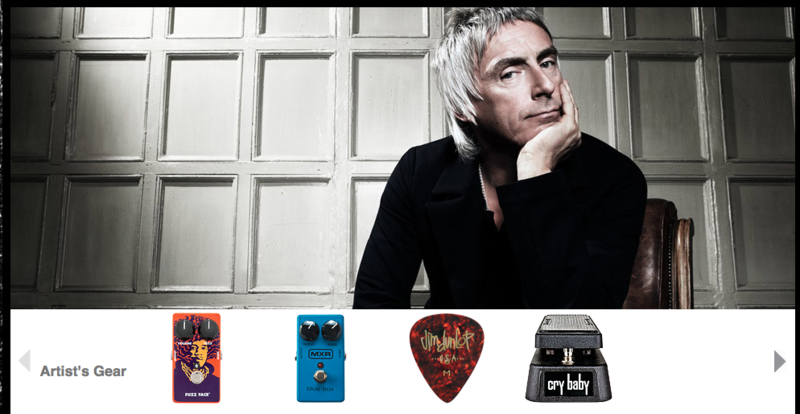 An MXR M-103 is listed among Paul's gear on [Dunlop's website](http://www.jimdunlop.com/artist/paul-weller). Seen here on Isaac's board. Appears to have changed the knobs. "I have an old MXR Blue Box that I love and I’ve used that quite a bit. I didn’t use it that much on this record though, but I used it on my last few records," Gilby Clarke says, in [this article](http://www.vintageguitar.com/2903/gilby-clark/). In this pedalboard photo, which was uploaded by Bynum on his Instagram profile, one of the pedals that can be seen on the board is the MXR Blue Box. "I always carry a Dunlop wah, Phase 90 (Re-issue), whammy pedal, vintage 808, Blue Box and a box full of delays, compressors and choruses"
In this diagram, it is revealed that Robertson used MXR Blue Box. Mr. Kenny Wayne Shepherd uses the MXR M-103 Blue Box Pedal on his pedalboard. Chris Lawrence mentions that Kim used an MXR M-103 Blue box according to [this post](http://www.sonicyouth.com/mustang/eq/kim.html) on Sonic Youth's official "Gearography". "The Blue Box is pretty awesome. This is the sound I use for our song 'Amen.' Definitely happy to have that on my board right now," says Lzzy Hale, at 10:20, in this Premier Guitar rig rundown. "That Blue Box is modded. When you turn it all the way up it gets some pretty good fuzz," Jesse Lacey says, at 13:50 in this rig rundown video. At 3:00 of this Rig Rundown for Stephen Carpenter of [Deftones](http://equipboard.com/band/deftones), he shows off some of his gear, including an MXR M-103 Blue box. A MXR Blue Box can be seen at 3:42 in this video. He uses Blue Box with block logo. According to this article about gear seen being used by Lockett Pundt, he has used a MXR M-103 Blue Box. It was seen on his board before the Line 6 M9 Multi-Effect took it's place. 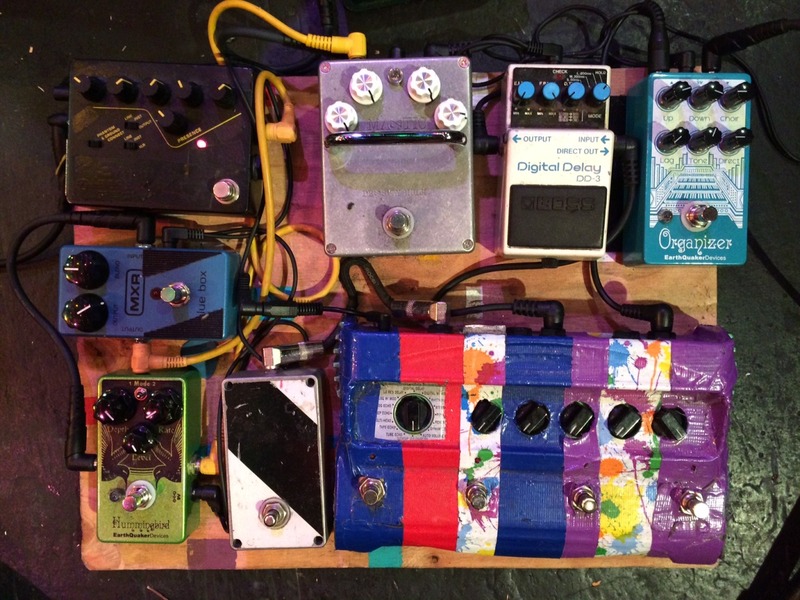 In [this image](http://i.imgur.com/e5qlvXB.jpg) from a 2013 live performance by Wire, Lewis's pedalboard is shown with a Blue Box on it. The MXR blue box is the third pedal in Day's chain in this rig rundown. It sounds like there are guitar loops, feedback loops, and such. Is that just the way you tracked it? > Feedback loops? Nothing is looped. 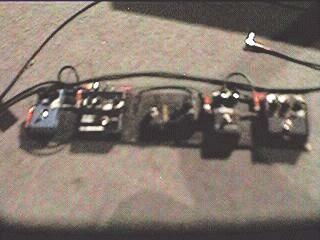 But Austin and I used [MXR] Blue Box [octave fuzz] pedals, so that gives it a uniformity. It might give the impression that it's one piece from which we're pulling, because it reduces it to this robotic sound. But there were no overdubs; it was all live. There wasn't any editing outside the mixing phase. Great for a little octave and some diasterous fuzz stuff! I love mixing this pedal's creamy gated fuzz and sub octave (-2 octaves) with either amp distortion, an overdrive pedal, and/or a wah pedal for some thick, angry, and ballsy synth-like guitar tones. On its own it's simple and though it leaves much to be desired, i'd rather have something simple than something pointlessly complex, especially for such a niche effect. I have a DIY (replica) version of this unit. I have modified it so I can choose 1 octave or 2 octaves down with a toggle switch. The fuzz is very close to a Marshall stacks OD. A very unique sounding effect. I recommend installing the mod available for this. Other than "fool in the rain" solo it hasn't made a permanent home in my pedal board. ???? If you're aware of Ableton Live's redux options. Then you know that it sounds like if 8-bit was played through a bad ham radio. The Blue Box can basically mimic the same sound (and also give you the option of different octaves). I use this pedal for my leads and also for my drones. It gives this really glitchy tone to your guitar as well as the feedback. If you're a fan of really dirty guitar tones. This is the pedal for you. This pedal is simple but has a wonderfully glitchy and scratchy fuzz tone that can go from wild and unpredicatble to being tame and just a touch of sub on top of normal tone. Minus one star for just a hair of volume loss when in use. You can get some really weird noises out of this little pedal. I like the fuzz I can get out of it. I noticed a long time ago DimeBag Darrell had this on his pedalboard. Kind of know where he got his fuzz from. It could have been a blue Arbiter Fuzz Face too. I had a script logo first. That now belongs to someone famous from my hometown. I recently picked up a block logo because Iw as missing that 2 octaves down Velcro fuzz.... these are fun effects. I ehar MXRs slash pedal ahs an improved blue box built in that also does octave up, sort of a blue box meets foxx tone machine? but the blue box is so cheap that I went for just the octave down. this is a real sleeper of an octave effect that more people should try. Just bought this sick little beast!! es un fuzz con octavador y otro parametro que parece ser un gate,un pedal increible. Good for stacking with distortions if you are brave, and produces a range of very usable synthy & unpredictable tones. It's affordable, handsome, and plays a unique role in distortion alchemy.